In the early ‘10s it felt like the progressive sludge scene had produced all of its great records, and that moving forwards the genre would settle in a plateau state. But in the underground, there was one band that was still not contempt with the confinements of the genre, and they displayed that with their debut record Sundown. Inter Arma’s first full-length might have unfortunately passed unnoticed, but the true wake-up call came with the band’s sophomore release Sky Burial. The record not only displayed some of the best heavy sludge music had to offer, but it also presented a roadmap for combining its weight with black metal eeriness, death metal brutality and a bluesy, southern core. The years passed and Inter Arma kept getting better and better. They released an amazing EP in The Cavern, presenting an ambitious 40-minute long opus, filled with both the exploratory sense that defined them and also the extreme metal spirit at the band’s core. In 2016 the band released their third full-length, Paradise Gallows, their most complete and beautiful record to date. 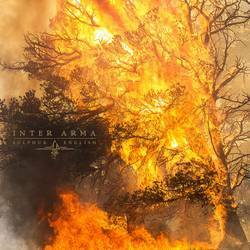 In this work Inter Arma explored a more melodic side, producing a stellar work of modern metal. What is certain from the band’s path so far is that they do not want to settle within one mould. And that tradition continues with their new record Sulphur English. In this new endeavor Inter Arma still arrive with many familiar treats. Post-metal ideas still combine with black and death metal ideologies to create the band’s bitter brew. “A Waxen Sea” sees this essence arriving with so much power and presence, as Mike Paparo’s deep vocals echo through ages. It is this sense of complete and utter devastation that always follows Inter Arma, and it is present no matter if they are going for a melodic, progressive or simply brutal feeling. The weight of the guitars masterfully combine the sludge and death metal styles to bring this terrifying beast to life and in Sulphur English this is as present as ever. However, Sulphur English sees the band explore also a slightly different direction. At first this appears as a meditative take on brutality. “Citadel” is an example of this dichotomy between the aggressive and the transcendental, arriving with an outright assault at first and then settles into a slower, more grainy sludge theme. But Inter Arma pay attention to their craft and make the procession feel like an overwhelming experience produced by the sparsity of the track rather than its in your face attitude. And from that point on, the band actually starts to introduce an array of new elements. “Howling Lands” slowly builds through ritualistic drumming with howling vocals standing alongside clean chants to create a labyrinthine opus. Soon enough acoustic guitars join in with “Stillness”, capitalizing on this hazy ceremony that further exposes Inter Arma’s southern rock element. The band revisits these themes later and dives further into this bluesy tone with “Blood on the Lupines”, drawing again from their southern heritage to create a deeply dark and emotive overture. To maximize the effect of their new folky, psychedelic element Inter Arma have laid out the record brilliantly. As the early storm comes to a close with “A Waxen Sea”, the band goes into a fully immersive mode from “Citadel” to “Observations of the Path”. Still, what follows is a return to the harsher self with one of the band’s finest moments in “The Atavist’s Meridian”. The track features a more complex progression and Inter Arma execute it to perfection, making its erratic movements appear more like a math metal offering. The track builds up for nine minutes, gaining momentum before unleashing a final outbreak that arrives with all of the band’s devastating weight and harrowing ambiance. The finale of the record is equally brutal, with the title track seeing the band return to its most volatile and terrifying form, embracing death metal to round up this fantastic release. Sulphur English is another testament to the band’s innovation and versatility. For Inter Arma there exists a duality between being progressive and forward thinking but also remaining true to their core aesthetics. In their new record they have managed to perform this herculean task once more, expanding their musical vision while still retaining their trademark style. Posted April 15, 2019, 9:02 p.m.
Posted Sept. 25, 2016, 1:28 p.m.